Stop Singing Me the Blues–Do Something! Recently, I listened to an interview about The Weight of the Nation, a documentary about the rising occurrence of childhood obesity, on NPR’s Fresh Air podcast. It was a fascinating discussion that highlighted the relationship between poverty and obesity. Though it can be somewhat difficult to get healthy foods on a budget, it is possible. Even those who are eligible for SNAP (Supplemental Nutrition Assistance Program, formerly known as food stamps) and WIC can have healthy foods. In fact, I looked at the list of approved foods for both programs in Oregon, and one cannot buy very many processed foods at all with these benefits. I was really surprised to find this out. So I asked myself how is it that when you watch shows like Jamie Oliver’s Food Revolution, you see that kids don’t know what broccoli is? They don’t know that French fries come from potatoes! Why are they lacking the fundamental knowledge of where food comes from and how to prepare it healthily? It’s a simple, two pronged answer, in my opinion. Parents are making bad choices in what they are feeding their children. They are tired, overworked, underpaid, underappreciated, and sometimes lazy, so they slack off on their responsibility as a care-taker to prepare nutritional meals that help young bodies develop properly. I’ve seen parents spend their last $20 on a fast food meal because they simply don’t want to cook for their kids. Sure, this is okay once in a while, but when it happens so often that the kid can’t identify a vegetable, it’s a travesty! No wonder these kids are obese. The other prong? Greed in the schools. As much as I want to scold the schools for trying to make a little extra money by pushing Taco Bell, French fries, mystery meat, and vending machine food like Cheez Balls, part of me understands that they are doing it out of necessity. Education is one of the most (probably THE most) under-funded programs in America. I find it incredibly depressing that we see the schools as the bad guy for selling high-sodium, high-fat snacks and meals, when they probably need that money just to keep textbooks in the classroom—and let’s be real…with the amount of low cost/free lunch programs out there, they barely come out even. There is a light at the end of the tunnel, and that brings me to my next point. Earlier this month, I volunteered at the annual Waterfront Blues Festival put on by the Oregon Food Bank. It is widely known as the best in the west, and in fact is the largest one west of the Mississippi, and has won several national awards. It is on the Willamette waterfront, of course, on beautiful green grass with large stages spread out so thousands of Oregonians can hear, see, and smell the glory that is the Blues Festival. I worked the main gate for three and a half hours, collecting donations for the Oregon Food Bank. I remember when I was a kid, seeing the boxes and cans that were donated to those who couldn’t afford to feed themselves. My mother always impressed on us that it was important to give back, so we volunteered at shelters and donated to food drives many times. It was always mushy green beans and high-sodium meals in a box. On that Thursday at the Blues Festival, however, I saw more people donating healthy (healthy as nonperishable food can be, anyway), organic foods than I have ever seen in all of my shifts at the Food Bank. It gave me a great feeling of positivity and hope. Perhaps this can be the start of a change that our country desperately needs. While it is really depressing that many of our poorer citizens don’t have the knowledge that would aid them in feeding their children healthy food, it behooves those in a better position to help out in such a fantastic yet simple way. It is a beautiful thing to see a helping hand extended when someone has fallen. I realize that we can’t all be advocates in a big way. We have our own problems and lives to deal with. We aren’t being paid like Jamie Oliver to change the world, but even something as small as consciously donating a healthier can of food makes a difference in someone’s life. If you’re truly led to help out more, there are constant opportunities at the OFB, and not just in organizing donations. Volunteers can teach parents how to cook healthy meals for their children and even how to garden their own fresh produce. I volunteered initially at the Food Bank because someone asked me to be their “partner in crime.” They were interested in going, and we all know that everything is more fun with a buddy. So I joined her, and went back several times on my own. When the email about the Blues Festival arrived in my inbox, I didn’t hesitate to sign up and recruit a friend to come with me. I hope you’ll be inspired by the spirit of philanthropy, feel the drive to educate yourself like I did, and reach out in your own unique way. Don’t ever hesitate to ask me to be your volunteer buddy! I’ll be there right beside you. 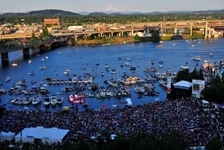 Picture courtesy of the Waterfront Blues Festival website. I’ve also noticed that a lot of parents feed kids fruits and vegetables from a can. It’s easy to prepare and readily available for those who use food stamps.This is a problem because the kids grow up not knowing what a fresh veggie tastes like and they think they won’t like it. So as an adult they still do not like anything but canned veggies and fruits. Yuck. It’s all full of sodium and sugar. I grew up eating top ramen noodle packets, never knowing how high the sodium was until after college. Another good movie on this subject is “Food, Inc”. Thanks for your comment, Emilie, and your suggestion of “Food, Inc.” I think it is truly disheartening how little Americans know about healthy eating. There has got to be a change!